A few weeks ago a new player jumped on to the scene. It’s called Meerkat, a new live streaming video app that you can share through Twitter. It is on the hot new girl in town and people are going crazy over it. You can see how it’s increasing in popularity on this graph from nothing to something exciting in a few days. According to SimplyMeasured, over 90,000 Meerkat videos have been streamed driving close to 300,000 views. Before we start getting too excited, that is only 3 views per stream. I’ve seen Shaq and Jimmy Fallon use the app, and usually when celebs join in, you can expect to a lot more adoption. It won’t be too long until the Kardashians are live streaming their lives for a price. Twitter just recently purchased their own live streaming video app called Periscope. Clearly Twitter knows the importance of breaking news and video. 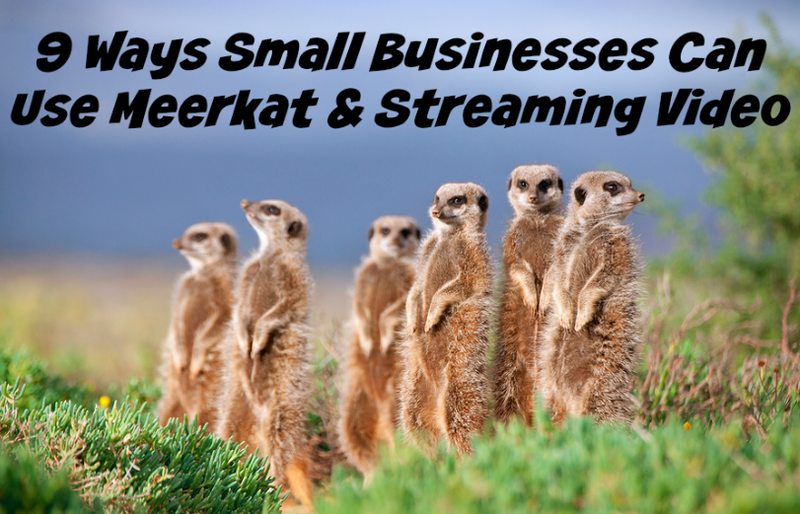 But the real question is, how can Meerkat and other live streaming video apps work for small business? Does it work? And is it worth it? Whenever there is a new app or a new site, I’m always eager to learn more. I think the businesses who start thinking about using it from the start have a better chance of making it work for them. Of course there is no doubt that live streaming video attached to social networks will change the way we interact with the news. Twitter already breaks news. Now we’ll actually be able to watch the news live through our social networks. Yes, live video can work well for events, festivals and concerts. People want to watch that. Obviously celebrity culture is a no-brainer for live streaming. There are some ways to use live video for small businesses, but you have to make it feel like breaking news for the viewer. So what does that mean? It needs to feel breaking and or exciting for anyone to watch. Plus, the more exciting it is, the more likely it is to get shared which increases the amount of people who can have access to it. Most importantly, it has to be used to help you increase sales otherwise there is really no point. You have to time it out right to reach the right people. Unlike breaking news where if something is that important, people will take the time out to engage and watch. However, a flash sale might not be something as exciting for others to drop what they are doing and watch. Sites like Snapchat and Instagram have been very popular because you view it on your own time as long as it’s still on your stream. You don’t have to be there right then and there to engage. With live streaming video, if you aren’t online at the time of stream, it’s gone. What do you think? Is there a place for live streaming video in small business marketing? These new services are the future! I can see them being used to increase a business’s following massively. Not only that, customers can see how authentic a business is and get to know it’s personality more. Just like with most other things, each business will need to come with content that will connect with their audience (or target audience). They could always announce on other platforms or advertise what type of content they will be doing to attract a following. The nice thing is, that these apps are spontaneous. The audience has to “follow” to be notified of the live stream. It’s a major incentive for “following” if you can leverage it.